Arthur Laffer’s recent piece in the Wall Street Journal on fiscal stimulus has generated quite a stir in the blogosphere – with mostly Keynesians and Market Monetarists coming out and pointing to the blatant mistakes in Laffer’s piece. 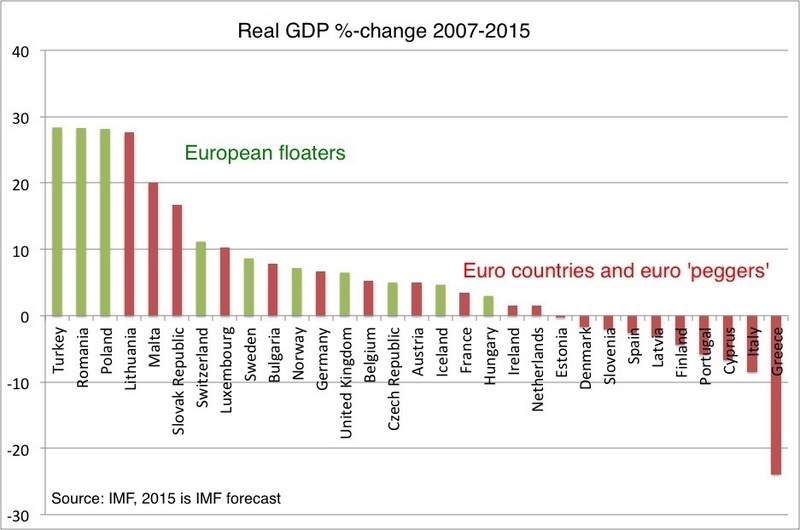 I on my part I was particularly appalled by the fact that Laffer said Estonia, Finland, Slovakia and Ireland had particularly Keynesian policies in 2008. In my previous post I went through why I think Laffer’s “analysis” is completely wrong, however, I did not go into details why Laffer got the numbers wrong. I do not plan to go through all Laffer’s mistakes, but instead I will zoom in on Estonian fiscal policy since 2006 to do some justice to the fiscal consolidation implemented by the Estonian government in 2009-10. In his WSJ article Laffer claims that the Estonian government has pursued fiscal stimulus in response to the crisis. Nothing of course could be further from the truth. One major problem with Laffer’s numbers is that he is using public spending as share of GDP to analyze the magnitude of change in fiscal policy. However, for a given level of public spending in euro (the currency today in Estonia) a drop in nominal GDP will naturally lead to an increase in public spending as share of GDP. This is obviously not fiscal stimulus. Instead it makes more sense to look at the level of public spending adjusted for inflation and this is exactly what I have done in the graph below. 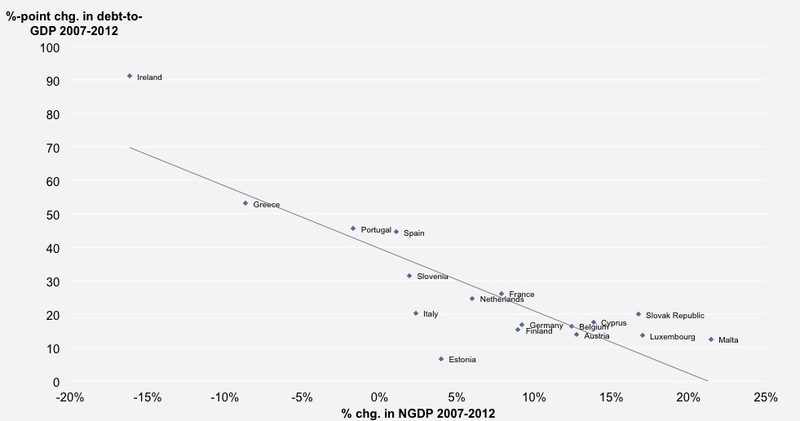 I also plot Estonian GDP growth in the graph. The data is yearly data and the source is IMF. 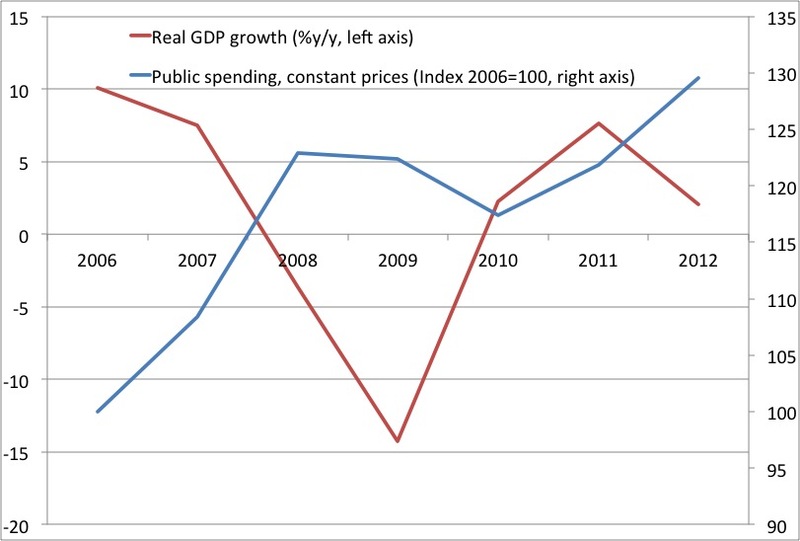 Lets start out by looking at pre-crisis public spending. In the years just ahead of the escalation of the crisis after the collapse of Lehman Brother in the autumn of 2008 public spending grew quite strongly – and hence fiscal policy was strongly expansionary. I at the time I was a vocal critique of the Estonian’s government fiscal policies. There is certainly reason to be critical of the conduct of fiscal policy in Estonia in the boom-years 2005-8, but it does not in anyway explain what happened in 2008. Laffer looks at changes in fiscal policy from 2007 to 2009. The problem with this obviously that he is not looking at the right period. He is looking at the period while the Estonian economy was still growing strongly. Hence, while the Estonian economy already started slowing in 2007 it was not before the autumn of 2008 that the crisis really hit. Therefore, the first full crisis year was 2009 and it was in 2009 we got the first crisis budget. So what happened in 2009? Inflation adjusted public spending dropped! This is what makes Estonia unique. The Estonian government did NOT implement Keynesian policies rather it did the opposite. It cut spending. This is clear from the graph (the blue line). It is also clear from the graph that the Estonian government introduced further austerity measures and cut public spending further in 2010. This is of course what Laffer calls “fiscal stimulus”. All other economists in the world would call it fiscal consolidation or fiscal tightening and it is surely not something that Keynesians like Paul Krugman would recommend. On the other hand I think the Estonian government deserves credit for its brave fiscal consolidation. The Estonian government estimates that the size of fiscal consolidation from 2008 to 2010 amounts to around 17% (!) of GDP. I think this estimate is more or less right – hardly Krugmanian policies. And maybe it is here Laffer should have started his analysis. The Estonian government did the opposite of what Keynesians would have recommend and what happened? Growth picked up! I would not claim that that had much to do with the fiscal consolidation, but at least it is hard to argue based on the data that the fiscal consolidation had a massively negative impact on GDP growth. Laffer would have known that had he actually taken care to have proper look at the data rather than just fitting the data to his story. Laffer of course could also have told the story about the years 2011 and 2012, where the Estonian government in fact did introduce (moderate) fiscal stimulus. And what was the result? Well, growth slowed! The result Laffer was looking for! Again he missed that story. I would of course not claim that fiscal policy caused GDP growth to slow in 20011-12, but at least it is an indication that fiscal stimulus will not necessary give a boost to growth. I hope we now got the facts about Estonian fiscal policy right. PS David Glasner has an excellent follow-up on Laffer’s data as well. PPS If you really want to know what have driven Estonian growth – then you should have a look at the ECB. Both the boom and the bust was caused by the ECB. It is that simple – fiscal policy did not play the role claimed by Laffer or Krugman. It is all monetary and I might do post at that at a later stage.